Taylor Swift, the country sweetheart with the catchy songs, curls to die for and most known for being intterupted by Kanye West during the 2009 MTV Video Music Awards. I bought this in April of this year and I’m just now reviewing it. 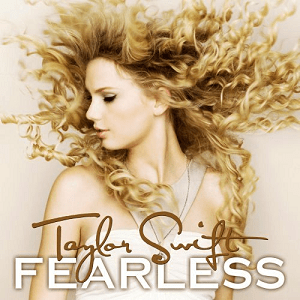 Fearless is Swift’s second studio album released, November 11,2008 and sold 592,000 copies in it’s first week. The album starts with Fearless, her fifth single released from the album. It’s a cute song with a nice melody you can sing along to, but nothing too earth shattering. Forever and Always is the best song on te album. It has a bit more edge with sarcasm and attitude, but still the sweet country sound. Perhaps the most touching song on the album, The Best Day, about her close bond with her mother. Breathe featuring Colbie Callait has a nice simple arrangement, but Colbie has such a sweet voice and when the two harmonize it’s like their voices melt together, it just works especially in the hook. Taylor isn’t the best singer, but she writes catchy songs with the lyrics that anyone can sing along to. She is a really good lyricist and although I skipped through majority of the tracks on the album I did enjoy listening to most of it. I rate this 3/5.